Comdain Gas maintain northern Victoria’s gas supply network and they need versatile equipment to be able to quickly affect repairs at any hour, which is where the B26 tractor/loader/backhoe (TLB) from Kubota Tractor Australia comes in. “To achieve our goals, we require compact machines that can manage the big jobs and that’s where Kubota’s B26 tractor/loader/backhoe (TLB) combination shines. Comdain started with the original B20 TLB’s progressing through to the B21 and now on to the B26 - all delivering excellent reliability,” says Ned Wilkie of Comdain Gas Shepparton Branch. With the B26 TLB, Kubota Tractor Australia continue to offer operators the benefits of versatility and performance they are renowned for. With more horse power than the previous model, the B26 has increased digging performance and increased frontend loader lifting capacity. The versatility of this manoeuvrable, combination TLB effectively makes the B26 three machines in one. Whether the job calls for a tractor with three point linkage, a backhoe, or loader applications, the B26 can accommodate all three. The B26 TLB also has a sleek, modern design that improves operator visibility and offers a skid steer-type quick hitch on the loader for convenient adaptation of other tools. The B26 TLB is powered by a 26 horsepower Kubota diesel engine offering a combination of high torque rise, low noise and vibration and cleaner emissions. In addition to the high output, the liquid cooled engine conserves fuel to lower operating costs. Based on a reinforced, integrated main frame, the B26 TLB has the ability to tackle the repetitive work of loader backhoe operations. Another feature enhancing overall performance is the easy to use hydrostatic transmission system (HST). Low effort is required for the single HST pedal to control both speed and direction changes quickly and without any clutching or shifting of gears. Forward and reverse movements are simple when using the loader for optimum control when working in tight spaces. The B26 TLB is engineered for performance utilizing a braceless loader frame for improved forward visibility and easier under-the-hood access to the innovative backhoe mount system. Loader lift height is 2400mm to the bucket pivot pin and a lift capacity is 590kg at the pins. Ned Wilkie says “The general design of the loader with it’s mechanical spill guard, built-in loader valve and all hosing and pipe work protected by being enclosed within the loader frame are a real benefit. Our operators can easily check the bucket level using the indicator located on the loader arm, and the position of the joystick together with the armrest make operating easy and comfortable.” B26 TLB’s are available with either a standard or an optional 4:1 bucket. The B26 TLB backhoe is built to be more versatile while offering in excess of 1900kg breakout force. The backhoe has a maximum digging depth of over 2400mm. The curved design of the boom allows operators to easily navigate around obstacles and achieve maximum digging depth with a minimum trench cut. 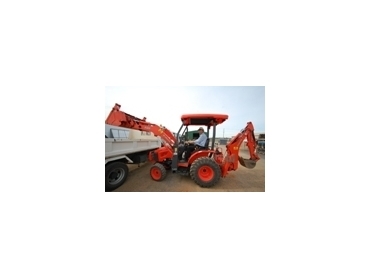 As with the loader all hosing and piping of the backhoe are enclosed for protection. To top off the versatility of the B26 TLB, the backhoe is a quick detach type. In minutes the B26 TLB can be transformed from a backhoe unit to a tractor with three point linkage capable of being used for slashing, rotary hoeing or other general farm or maintenance chores. This optional three point linkage has a lifting capacity of 760kg 600mm behind the linkage pivot ball ends. All control levers required for three point linkage and PTO engagement are already mounted to the B26 TLB.